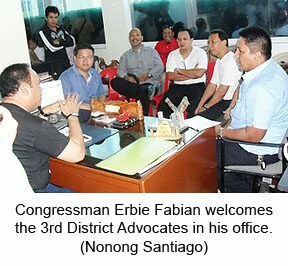 ZAMBOANGA CITY, Philippines - The 3rd (Legislative) District Advocates yesterday sought Congressman Erbie Fabian's support and permission to conduct consultations and dialogue in the different barangays under District II in order to get the true sentiments of the people with regard to the creation of a third legislative district in Zamboanga City. Councilors Rommel Agan, Mel Sadain, Cesar Jimenez Jr., former Vice Mayor Mannix Dalipe, former Councilors Al Jihan Edding and Atty. Kim Elago yesterday afternoon paid a courtesy call on Fabian to inform him on their forthcoming consultations with the people under District 2. Fabian said he will deal with the issue with an open mind and will even join and observe the consultations if his schedule permits. “I will have to weigh the pros and cons. It is a privilege to listen to what the people really wants. Whatever the outcome of the consultation will form part of my report. It will even serve as basis in the filing of a bill in the House of Representatives,” Fabian assured. The congressman hopes that everybody will be very objective and exhaust all measures in discussing the third district issue. Agan disclosed after meeting with Fabian that their next move is to also meet with Congresswoman Isabelle Climaco to extend the same courtesy. Agan said they will meet again and thresh out details on the conduct of the consultations.